Free SWF Video Converter Factory is specially designed for converting HD (High Definition) video files between each other. 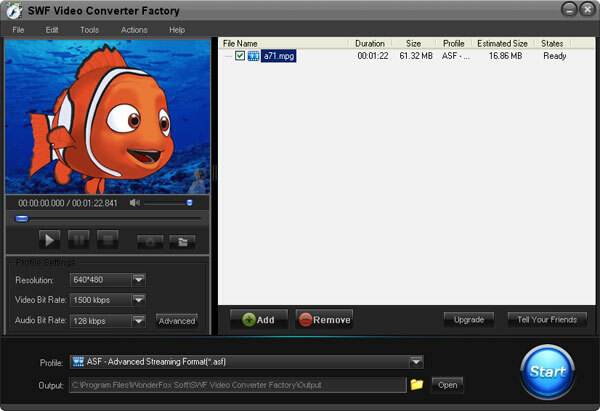 Meanwhile, it enables you to convert HD videos to SD (Standard Definition) videos, and convert SD videos to HD videos effortlessly.Video formats such as AVI, MPEG, WMV, MKV, MOV, and FLV can be converted into SWF (Flash Video) by Free SWF Converter Factory.You can also adjust settings such as audio/video quality, file size, frame rate, bit rate and sample rate according to your preferences. Start transforming your audio and video files into internet-ready format with Free SWF Video Converter so you can share them with your friends and family! *Convert common video formats such as MOV,MP4, MP3, M4A, AVI, FLV, WMV, and MPEG to SWF. *Simultaneously convert videos into SWF format and HTML page in one click. 4Easysoft DVD to Pocket PC Converter is the easy-to-use DVD to Pocket PC Converter that can convert DVD to WMV, AVI, MP4, 3GP, 3GPP and HD video for Dell Player, HP iPAQ, General Pocket PC, Xbox, Palm Pre, etc.